1) Make a note of the polarity orientation of each of the existing capacitors BEFORE removing them. The capacitors have a stripe on the can to mark the side of the negative (-) lead. My iMac has a "+" mark on the component side of the board nearest the positive (+) hole. The positive lead (the one WITHOUT the stripe) goes in this hole. It won't hurt to take close-up photos of your board before you work on it for reference. 2) Follow the instructions in the box. Make sure the desoldering tool has had at least 5 minutes to heat up. 3) Make sure the hole in the tip of the desoldering iron is full of fresh solder before applying to the old pin. 4) Put the midplane board on a firm, flat surface, with the component side down (pins up). Put the iron over the pin, barely above the surface of the board. After a second or two, heating the pin only, push the iron against the board (and the pad) gently for no more than 3-4 seconds. You should see the solder from the iron "blob" out around the bottom. 5) Immediately tap the trigger for a second and remove the iron. The hole should be vacuumed clean. If not, fill the hole in the iron with fresh solder (important!) first, then try again. 6) The old part will probably still be stuck in the hole, but since almost all of the solder will be gone, you can remove it by gently rocking the cap back and forth to break the remaining bonds. If this doesn't happen easily, apply the iron to the pin only (pushing the pin against the inside the tip) to heat it up enough while sliding it out of the hole in the board. 7) If the remaining hole is still full of solder, fill the hole in the iron again with fresh solder (don't forget this step for every connection) and place gently against the hole in the board no more than 3-4 seconds, then hit the trigger again. This should clear the hole. Always keep the tip clean. I used a wet sponge and a small tin of tip cleaner from Radio Shack, followed by a touch from the new solder. 1) Check and double-check the direction of the positive-negative leads – the pin with the stripe on the capacitor can is the negative (-) side, and typically goes in the hole with the round pad on the opposite side of the board. The side without the stripe is positive (+), and goes in the hole with the square pad. The positive lead on the new capacitors is also longer than the negative. 2) Make sure each hole is open and clean. Gently scrape or brush away any flux leftover from desoldering, and clean each location with isopropyl alcohol. 3) Clip the leads of the new capacitor so that about 1/4" of wire protrudes through the bottom of the hole when inserted in the board. 4) Insert the capacitor in the board and check for the correct orientation. You can bend the leads slightly to keep the cap from dropping back out of the hole. 6) Apply fresh solder to the tip of the desoldering tool, filling the hole, before applying it to the new pin. 7) Put the iron over the whole pin, barely above the surface of the board. After about one second of heating the pin only, push the iron gently against the board (and the pad) for no more than 3-4 seconds. You should see the solder from the iron "blob" out around the bottom. Be careful not to hit the trigger for the pump! Pull the desoldering tool quickly and immediately away from the pin. You should see a nicely funnel-shaped solder joint, bright silver, filling the hole completely. You have never really soldered have you? It is pretty clear that you have read up on it but never actually done it. Flux is your friend with lead free solder. Required if you want to keep the temps lowered and not hurt components. For most SMDs you need a small conical tip, not a wide tip. If you are doing things right a low wattage iron is fine. 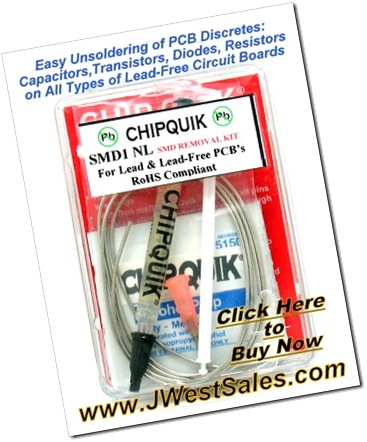 I can assure you that I have indeed soldered both lead free and Pb soldered circuit boards over the years. It is obvious that you have never unsoldered or soldered the capacitors on the lead free Apple iMac motherboards at all. Yes, flux is helpful, even with the large capacitors. However, the emphasis of the lead free soldering article above is not talking about unsoldering or soldering lead free surface mount components. It is talking about the specifics of unsoldering the large capacitors on thick MOBs, that are soldered in place using lead free solder. If you were doing surface mount components, then a small conical tip would be fine. However, (experience dictates), you need a wide tip for maximum heat transfer in the shortest amount of time at the solder junction between the pad and the leg of the capacitors on these puppies. I know many “experienced” folks find it hard to believe, that unsoldering these puppies could be as difficult as they are, and think to themselves, he doesn’t know what he is talking about. That thought process generally comes from someone who knows it all. Please understand this, a low wattage iron is not fine for unsoldering or soldering the capacitors on the thick lead free circuit boards that Apple has designed in their iMac G5 computers. Using a low wattage iron will cause much grief, aggravation, some choice words, possibly damaging the board in the process, or breaking off the leads in the holes because it was not hot enough at the main solder connection. Note also, that the Chip Quik desoldering flux and alloy kit help immensely in the repair process, but still a good, higher wattage, hot iron (that maintains temperature), and a wide tip are required. On my logic board almost all the 1800, 1500 and 680 uF are bulged and look bad. The others look pretty good, no leaking or bulged, would you recommend to change them anyway? Considering the less I solder, the less the risk is to damage the board. I tried fixing mine with a 30W, and I found myself holding it there, then still having a bear of a time rocking it out. I clipped down the wire on the backside, so I could get maximum contact to pin, pad, and existing solder, and while it would appear to melt, it wouldn’t get fluid enough, especially not all the way around. Regarding the removal of solder in a plated through hole after removing a part, I sometimes heat the solder to melting, then tap the circuit board onto the table top. This works well but may take a little practice. Start gently until you get the nack. I have some old PPC a 9500, 7200, Beige G3, some Sonnet PCI cards. I am wondering about recapping particular machines. They are almost 20 years old!! And all I know about electrolytic capacitors are they dry out. Are Apple’s computers built with exceptional components or something? I would say that all the computers that have been built have used common components. I had some older Power PC computers myself, but never checked the caps out on those. It is likely that many of the older computers have electrolytic capacitors that are dried up, and no longer properly filter the voltage ripple. I had to recap my Gateway monitor a while back because of bad capacitors. Additionally, I also had to recap a big screen television due to bad capacitors. It’s been a long time since this article came out. I’ve been using the Chip quik solution since then (must admit only in 3-4 occasions) but with quiet a success. I’m about to upgrade from a Standard Soldering 80w Weller to a Hot air Rework station. (Aoyue 968A+ could be a candidate still looking and deciding). Do you think a Hot air Gun could be an alternative to the ChipQuik for desoldering these little devils? My gut feeling is the hot air guns are not going to get the job done. However, I have not heard from anyone that has tried one.